Taken in Jack White's arcade photo booth at his home in Nashville. 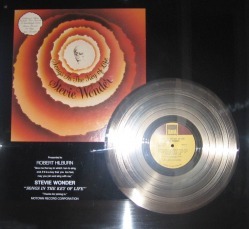 Stevie Wonder's "Songs in the Key of Life." My own bobblehead, right. Trivia fans note I'm holding a copy of the Los Angeles Times Calendar section in one hand and a Sun record in the other. Autographed poster from one of Joni Mitchell's self portraits. 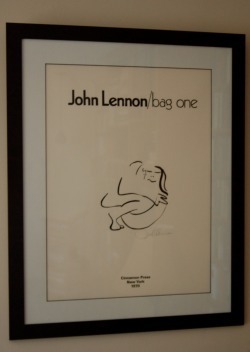 Poster autographed by John Lennon. I also, gulp, have a souvenir packet of dirt from Graceland. Beck's "Odelay" and Eminem's "The Marshall Mathers LP."